You may recall the following campaign slogan promoting red meat: Beef. It’s what’s for dinner. If you’re anything like me, and I don’t mean intelligent and good-looking, it’s also what’s for lunch, and even for breakfast. Most beef lovers around the world may have trouble justifying the enormous expense that the world’s most expensive steaks command. But what I’ve discovered in researching this topic is that compared to some other foods, beef is a bargain at any price. The Yubari King melon, a cantaloupe from Japan, is so expensive that it’s routinely sold by auction. Grown in greenhouses in a small town on the island of Hokkaido, it’s actually a hybrid of two types of melon. In 2008, one melon sold for $23,000. Which begs the question: Why aren’t I growing some Yubari King melons in my backyard. Almas Beluga caviar is eggs from an albino sturgeon found in the Caspian Sea off the coast of Iran. The price tag of $25,000 per kilo also includes a tin made of 24 carat gold. However, if you’re short a backyard money tree, and still a lover of fish eggs, you can get a tiny miniature container for (ahem) only $800. And then there’s the Italian White Alba Truffle. This fancy fungi, which is a fruiting body of a subterranean Ascomycete fungus, once inspired someone (who apparently didn’t throw up in their own mouth at the mere thought of it) to pay $160,000 for 1.5 kilos of the so-called delicacy. Everyone seems to agree that the best beef in the world comes from Wagyu cattle. Translated from Japanese, Wagyu simply means “Japan cow”, and is the same breed responsible for the world famous Kobe beef. 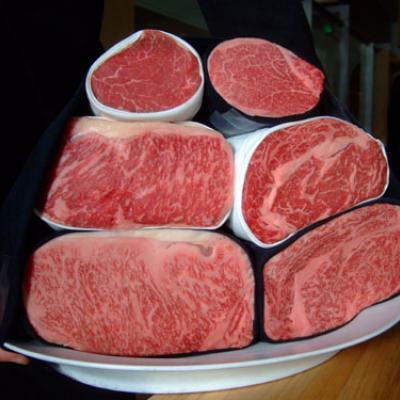 Wagyu are the king of cattle, world renowned for their densely marbled meat. Unlike most of their inferior bovine cousins, their delicious flesh contains streaks of fat evenly distributed among the lean portions. The more fat, measured numerically from 1 to 12, the better and tastier the meat. A rating of 12 translates into a marbled fat content around 90 percent. Not only does it melt in your mouth, it also melts in your hand like butter. Outside of Japan, it’s highly unlikely you’ll find any meat measuring a rating higher than 9. Kobe beef means that the meat came from Wagyu cows raised in Hyogo Prefecture. The name is location specific. 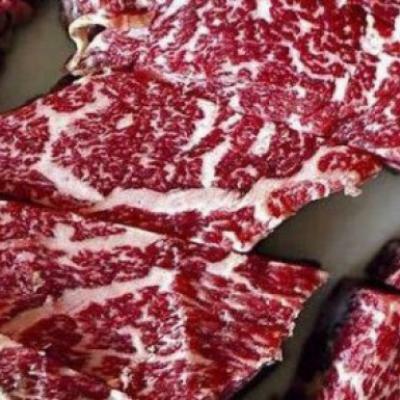 And while the rest of the world considers it the top dog of beef, so to speak, the Japanese seem to prefer Matsuzaka beef, from female virgin cows in an area of Mie Prefecture. 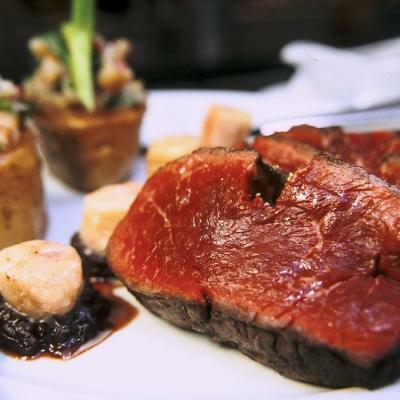 However, the common element remains the same – the Wagyu cattle. Wagyu cows are restricted from grazing, to insure less muscle and more fat, given mineral water to drink and daily massages, and fed beer and sake, along with a much higher quality grain than American cows. In 1989, one cow sold for the ridiculous price of $392,000. Which, I suppose, makes all that pampering more than justifiable. Let's take a look at the top 10. 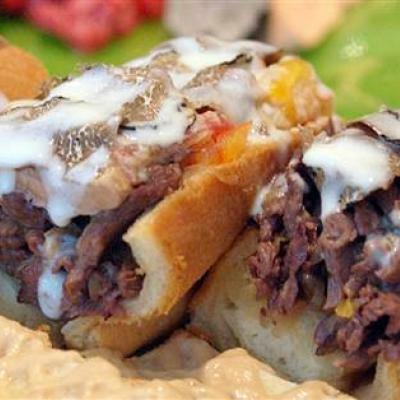 The best Philly Cheesesteak comes from Philly. Who would’ve guessed? This expensive sandwich is made with Kobe beef, homemade fontina cheese and served on a sesame bun. Oh, and it also comes with a small glass of Dom Perignon. Have the urge to eat like a caveman? This bone-in, meat-club of a steak is only served a la carte. The bone handle protruding from it adds some flavor, and a whole lot of attitude. However, you won’t find it on the menu. 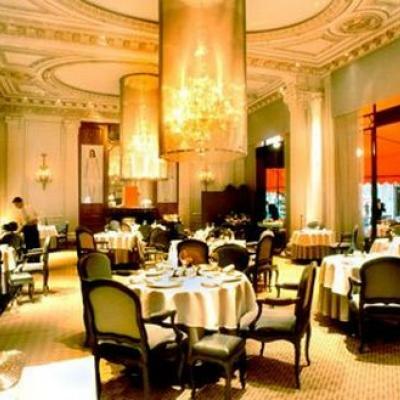 Instead, its presence is announced when carried from kitchen to table on a large platter, prompting others to order it. 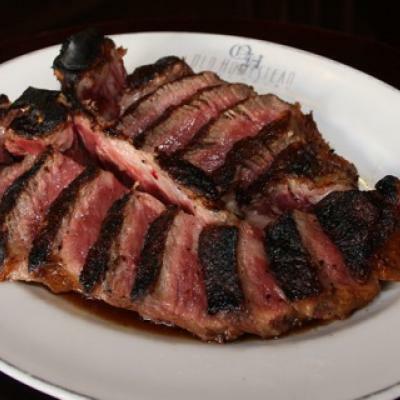 This incredible piece of meat is priced by the ounce, with a six ounce minimum. The price tag of $144 is for that minimum amount. But for that price, you also get the joy of cooking it yourself at your table. Whether you have the skills or not. Talk about performance anxiety. From world-famous chef Wolfgang Puck, this eight ounce slab of pure delight comes from cattle raised in Miyazaki Prefecture in Kyushu, Japan. One food critic described it as “orgasmic”, invoking images of Meg Ryan proving a point Billy Crystal doesn’t want to accept. 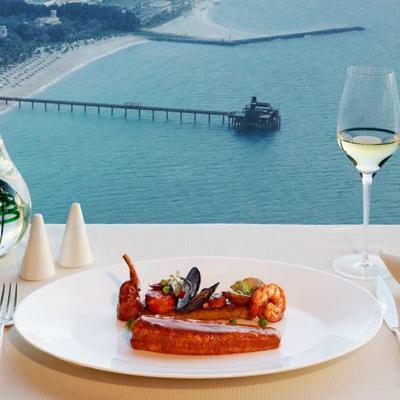 Seated at 700 feet above the sea, the Al Muntaha Restaurant in the Burj Al Arab Hotel in Dubai, serves up this 10.5 ounce strip of heaven with unmatched views to boot. The menu also includes a Wagyu burger for only $114. 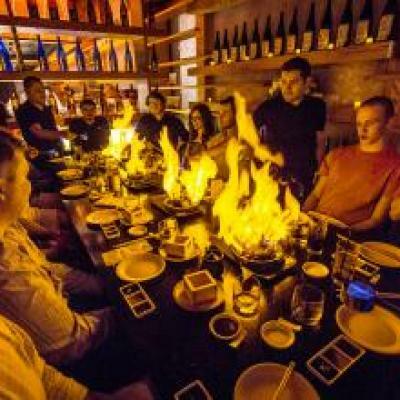 It only makes sense that a fine Kobe steak should actually come from Kobe, Japan. The all-female kitchen team cooks this 5.6 ounce delicacy old-school style on a one-inch thick iron and copper grill, covered with a traditional Japanese paper. The meal also includes salmon, salad and dessert. At 14.1 ounces, it’s the largest piece of beef on our list. The cows are grain-fed for over 600 days and raised in Alexandra, Victoria specifically, and only, for Prime. And their 9+ marbling score is the highest outside of Japan. Did you think we’d make it through this list without a New York City restaurant? The city that never sleeps, certainly eats, and they eat well. 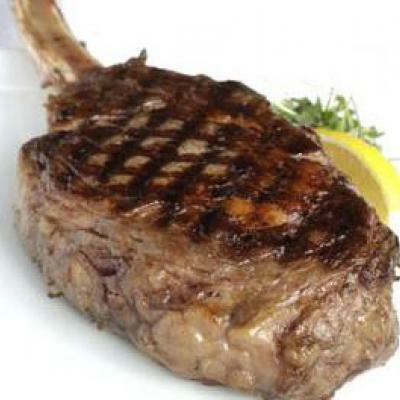 This 12 ounce strip-style steak comes from cows that are restricted from grazing, ensuring less fat and more muscle. And even though it comes with a hefty price tag, the Old Homestead manages to sell more than 25 of these steaks each night. Please stop scratching your head, your hair will fall out. That price is correct. This beef, if we can call it beef, didn’t come from a cow. It was grown in a lab. 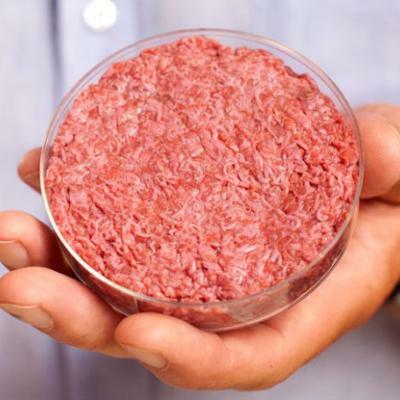 Dutch scientist, Mark Post, Frankensteined this beef burger using stem cells in order to promote animal welfare. Doesn’t that sound delicious? Perhaps someone should explain the food chain concept to the good Dr. F.